I saved the best for last. Poggio was definitely the MVP of the night. **Most Variety of Pork! ** lol Right in front of their station was a beautiful assortment of how they plan to delight the crowd for the evening. They definitely used every part of the pig for the Hog in the Fog event. I love the concept that nothing goes to waste and everything was Deee-Lish! Poggio was the only table to offer such a variety and changed up the types of pork they serve. Smart strategy to keep guests coming back again and again! At the beginning of the evening Chef Peter McNee was shaving fresh deli meats. He created a wonderful assortment where Pork was the main focus. At Poggio they serve rustic Norther Italian cuisine using their own organic garden. They served the most tender and moist Pork Belly topped with a fresh slice of Tomato, Avocado, some Micro Greens, and Sardine. This looked so tasty that I had to have it. Poggio was really serving it up at the Hog in the Fog! Even though pork belly may be super fatty and heavy, they really paired it well and made it taste refreshing. I was astonished at how nicely the sardine went with everything. The tomato they used was very juicy and sweet adding tons of flavor to the bite. I'd definitely go to Poggio to try their pork belly and any other culinary creations after this. Ms. Lin loved the freshly Grilled Sausage with Vegetables. The meat had just the right amount of firmness and juiciness. I loved the pressed cubed pork topped with fresh cherries. Pork is meant to be eaten with a sweet component to enhance the flavor. The Pork Loin was super tender, grilled well, and full of flavor. I was surprised at how tasty the honey kumquat was and how nicely it paired with the pork. This is probably the first time I liked kumquat! There was no hint of the super sourness, just pure sweetness. Yum! Maybe I will play around with my kumquat tree to make some of my own. Although the pic does not do it justice, but the Pork Rillette was fabulous. Inside the earthen jars in front of the station was a smooth spread accompanied with house made mustard. As you can see I globbed on the delicious spread. It was very flavorful and melted in my mouth. I was tempted to steal the jars! =D They also offered blood sausage that Ms. Lin ate because I draw the line there. Actually I would eat it, but considering there's so much yummy food in the tent I had to save room! All in all I loved Poggio's station! Ms. Lin and I went home to look up where they are and wondered how come neither of us had heard of them. Alas... they are in Sausalito! Ms. Lin hates crossing the bridge and paying the toll but I am seriously considering to visit them the next time I am up. Make a day in beautiful Sausalito. Nothing could be better than sipping wine, looking out to the bay, and enjoying a great charcuterie board! No longer is Orange County behind Los Angeles in gourmet food trends. 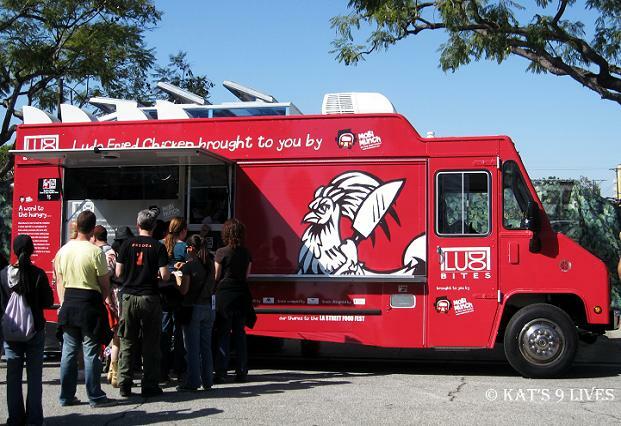 The hottest food trend these days are gourmet food trucks. Gourmet tacos, pancakes, ice cream cookie sandwiches, shaved ice, and more are mobile now. Ditch the old notion that food has to be confined in a building. Instead of having to drive far away for sumptuous delicacies, they are being hand delivered to you! 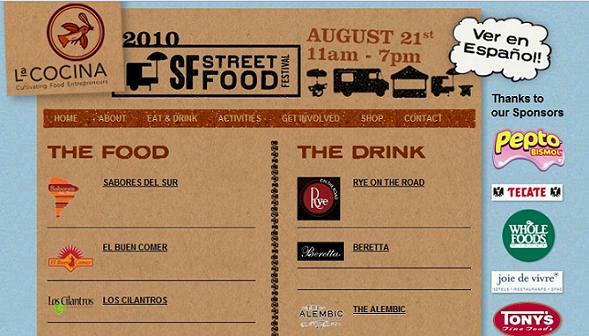 The first annual OC Foodie Fest is scheduled for Saturday, August 28th 2010 from 11:30 AM – 7:00 PM at the Honda Center. 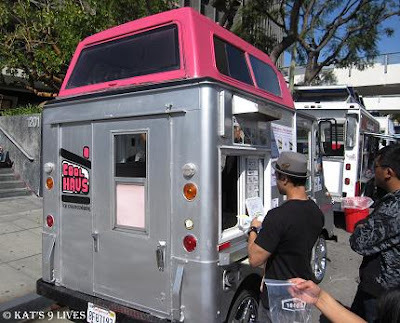 Enjoy all the luxuries of the most popular gourmet food trucks from OC and LA in one place. 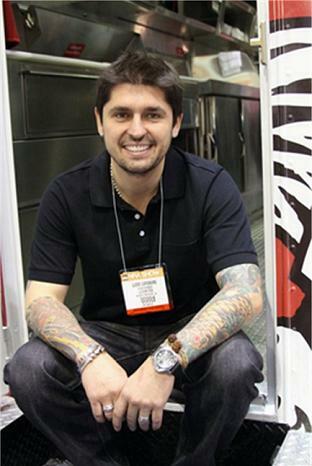 Notable Chefs like Chef Ludo Lefebvre, who has been named “The Chef of The Future” by Time Magazine, will be there with his Ludo Truck. Having been to Ludo Bites 1.0 – 5.0, nothing beats his succulent fried chicken. OC-ites will not have to fret that they were not able to make a reservation to Ludo Bites 5.0 since his famous Fried Chicken will be available at the OC Foodie Fest. Get them while they are piping hot, fresh from the fryer, and from the Top Chef Masters himself. Believe it or not, but the chicken tastes better from their specially designed truck! The infamous Cool Haus, The Buttermilk Truck, Crepes Bonaparte, and much more are scheduled to be there. Fifty gourmet food trucks from all over will be serving tastings of their ingenious creations at a special price of $1-$5 so that everyone can have room to sample all the trucks. Many eclectic live bands will be performing throughout the day. The headliner band is the Anaheim-based folk/soul rock band, Dusty Rhodes and The River Band. Team Breed of Boogiezone, Team Millenia, and The Beat Freaks from MTV’s America’s Best Dance Crew (ABDC) are scheduled to perform. The event will be family and kids friendly. Pretend City Children’s Museum has set up an entertainment area for kids of fun and educational activities. Come support local artists and businesses offering distinct art, handmade crafts, and unique clothing. Portion of the proceeds will be donated to local charities. The OC Foodie Fest will be the place to be to taste the delectable creations both Orange County and Los Angeles has to offer, dance along to the jamming music, watch great artists perform, grab a drink at the Beer and Wine Bar, have a splendid time! The Honda Center in Anaheim is one of Orange County’s premier event venues. They were super busy which was great for a grand opening and we got ourselves a nice seat in front of the guy shucking oysters! At first I thought, LUCKY! The guy talked to us and was friendly. I was feeling the vibe and it seemed like it would be a great start of the night. The server came by and took our order. All was going fine. I watched as the guy kept shucking and kidded with him about how I want to steal the tray of oysters. In retrospect, I should've taken them all for myself! So... time goes by.... it just gets worse and worse. Trekkie and I sat there trying to chat through the loudness, which was fine. As we continued catching up... time is slowly passing by. No drink.. no order... no server... everyone is running around with their head cut off. Albeit that is to be expected on opening night and I wasn't too upset. We just sat there and chilled.... almost an hour goes by.... nothing... nobody to take an order for food or getting our drinks.... we've been ready to order when he took our drinks but nothing.... We are just watching the guys shuck the oyster. Finally the server comes back to take our order... we said we wanted to start out with just a dozen oysters... he tells us that the kitchen just 86-xed the oysters... we are like what?? Keep in mind they opened at 4:30 PM and we were there by 5:30 PM... within a 2 hr window for their opening night celebration they ran out? WHAT? That is super poor management and the fact that I sat there watching the guy shuck for an hour and nothing??? This is what's worse, the people next to us came in after us and the guy took their order a few minutes before us got oysters and were DENIED! WHAT THE EFFFFF! We have been there for an hour and got nothing? At this time I was more annoyed but not really angry... we ordered a few appetizers to try out. It really bothered me that the people next to us got their food and had oysters! What? Then we just sat there... I think the appetizers we ordered came out before the drinks! The worse part was the drinks were FAIL! Trekkie got a Cadillac Margarita and they suggested the South End Vanilla Latte. I left my drink there. It was just a coffee liquor with probably bad Vodka... or that is what it tasted like. Trekkie wouldn't even finish my drink and he just drank his, which he thought was nothing special. Oddly enough they have Three Baked Oysters with Spinach and Garlic Shallot Cream. The server was confused but came back from the kitchen and said they were good. This was actually the last appetizer to come back because it takes time to bake. I drizzled it with lemon juice and ate the oyster first... **crunch! ** OMG there's rock salt in the oysters itself?? Chewing continues.. **CRUNCH** Even though I was being super careful, owwww! I regret ordering this and the worst part was I wanted this dish. I didn't even bother consuming another one. The mood didn't turn sour really until the end. After finishing the 3 small plates, we just sat there. Even though we are in plain sight and near all the staff, it felt like we were off in a ragged corner that gets no service or anything. They had plenty of employees for a small place and it seemed like they didn't know how to work the machines? We were waiting for a while to get our check because we were ready to go. Trekkie had to work really hard in getting one of their attentions to even getting the check! We've had enough of the bad service, bad drinks, and bad food. Even after we put our cards out at the edge, right next to the computer station, no one took it. Finally we flagged down the guy to charge us, then more waiting. At this point the ceviche was no longer enough to save the experience. During our appetizers I actually discussed how I want to return Saturday to catch the deal. Slowly... I noticed all their faults as we sat there bored and getting more annoyed. I was astonished to hear from Trekkie, "I am actually hungrier than before I came here!" Poor him! I feel bad exposing him to such a travesty! He wasn't even hungry to begin with but after this meal he was ready to wash this horrid experience away with some real good food. What really bothered me is that we were there early and they ran out? If you plan to offer a "SAID" special of $1 oysters and free bubbly, you should provide! This is your "grand opening" but I feel that this was just a ploy or just really POOR management. Either way it was sad and disappointing. We questioned why they didn't give us a normal menu to order oysters... still .. as a "promotion" you should have at least enough to last for more than 2 hours! Trekkie even asked the server about the bubbly and he never even came back. This is probably one of the rare times that I actually suggest a lower tip because it was just such a bad experience. As soon as I left the restaurant, I called up Ms. Lin to tell her how horrendous it was. You don't show a woman oysters the whole time and give her none! In the 2 + hours we were there... we only got 3 appetizers and finally 2 drinks... Poorly done... I am writing this for my readers to warn them about the false advertisement to entice customers. Just go to Hog Island for Happy Hour. It is about the same wait with better oysters, better service, and ACTUALLY give oysters that they promised! Got any plans tonight? If not then make some to head out to 6ix Park Grill at the Hyatt Regency Irvine to celebrate their 6th anniversary. The offer monthly mixer events. "6ix Park Grill invites diners and revelers to join in the birthday bash, which will feature a dessert gallery of tasty treats paired with one glass of complimentary Foley Chardonnay or exclusive Goodnight Cabernet Sauvignon. The all-night Happy Hour will consist of $5 wine, $6 appetizers, $6 custom signature cocktails including a red velvet cake concoction created for the occasion, and several birthday surprises with drawings and prizes. The birthday festivities will be held on Friday, August 20, 2010 beginning at 6pm. In addition to the birthday mixer, 6ix Park Grill will celebrate its birthday the entire month of August. Those who dine at the restaurant for lunch or dinner and say to their server, “We hear you’re turning six and want to celebrate with you,” will receive a complimentary piece of cake. Attendees of the event will also enjoy complimentary valet parking and a lushly landscaped outdoor patio equipped with a fire pit to enjoy Southern California’s beautiful climate. 6ix Park Grill is open everyday for breakfast (Monday-Friday, 6:30am-11am; Saturday and Sunday, 6:30am-12pm) and dinner (5:30pm-10pm). Lunch is served daily 11am-2:30pm. Brunch is served on Saturday and Sunday for $31 and includes breakfast buffet, choice of entrée, dessert display and complimentary champagne. Happy Hour is Monday-Friday 5:30pm-7:30pm." 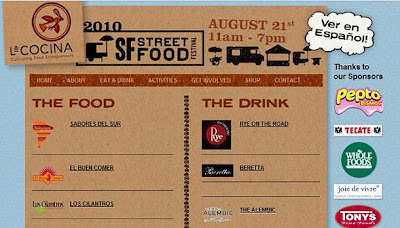 SF Street Food Festival : August 21st, 2010 - Bring Your Appetite! The Festival will take place in the Mission District on Folsom St. from 24th to 26th, 25th from Treat St. to Shotwell St., and Treat St. along Garfield Park. Buy a passport in advance beginning June 1st and save money and time! Just click on the Eventbrite logo. We have 5 affordable options to chose from. Important Note: Passports can be shared amongst friends, families, neighbors and strangers. Come join in on the fun. It's a perfect day to come up to SF to enjoy the best they have to offer. The latest food trends are brought to you in one spot to enjoy! With surprise snacks and great "Street food has the power to bring communities casual, affordable, delicious foods made by food entrepreneurs who reflect San Francisco’s diverse population. Policies that support the formalization of mobile vending will work to connect communities throughout San Francisco’s spectrum of class and culture to the everyday food that we all eat and love." At the beginning of the tent was Namu with Chef Dennis Lee. They had an assembly line of making their infamous tacos. Instead of using tortilla, they use seaweed paper and a fresh slice of lettuce to encase the braised pork. Cuesa Market provided a healthy sampling of their produce. I saw people walking around with beautiful figs and I just had to find the source! They were fresh, sweet, and plump. We were also given their champagne grapes that were super sweet and tasty. Both Namu and Cuesa Market can be found at the Farmer's Market at the Ferry Building every Saturday. They are definitely worth a visit and treat! Time to get your gnaw on with the Suon Nuong from Le Colonial, a 5-Spice rubbed Niman Ranch Pork Ribs with Honey-Ginger Glaze. For a light touch Chef Joseph Villanueva added the Goi Du Du of shredded Green Papaya, Carrots, Rau Ram, Vietnamese Coriander, Basil, and Peanuts tossed with Nuoc Cham Vinaigrette. Ame served up Uni and Prosciutto on top of Crostinis. I was very excited that they pulled out such a nice ingredient to share and I know how much Ms. Lin LOVES uni. For me, the uni had a little sharp kick that differed from other fresh uni. Next door was XYZ serving a fashionable Pork Rillette that resembled a bone marrow on the stick. It was a nice mix of sweet and savory. Chef Melissa Perello from Frances prepared Peach Blinis to celebrate Hog In The Fog. I enjoy seeing a huge display of cheese just waiting to be devoured, or it just me? The Parmigiano Reggiano at Bar Bambino's table was calling out to me. What even caught my eye more was that they were frying up balls of cheese??? Well not quite, but I can't deny the sensation when I see melted cheese slowly dripping down. They prepared little croquettes of risotto stuffed with pork and cheese, then fried. The night was young and I took a nice break in the POM Double Bubble Lounge to rest up before continuing my quest for great food. I love these festivals where they celebrate and bring out the best talents of the city. For me, the best part is I can say I have tried all these places! Of course I have been to a bunch and it is just great to grab a bite. It's also a great chance to explore and taste test new restaurants so that you can mark them down on your list. There's one place the really outdid themselves and stood above the rest for me... coming up! So stay tuned!